Looking for something a little different than your normal iPhone or even your normal run of the mill Android? 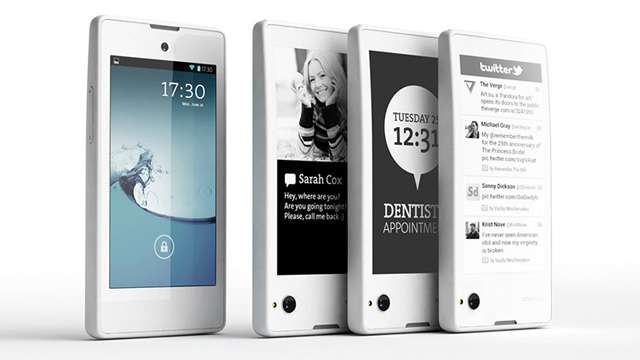 The YotaPhone definetaly takes things to a new level innovation wise thanks to its Dual Screen display with one of them being an E-Ink display for reading and other specific tasks. The low-powered E-Ink screen can be left on at all times, only updating when new notifications come in, allowing you to take a glance at incoming messages without chewing through power reserves. It'll also be a fair bit more comfortable for lengthy reading sessions, while the fact that E-Ink screens retain the last image pushed to them even when out of juice could be useful for when the handset's battery does eventually completely die. Unfortunatly for USA customers this is a Europe exclusive at the moment with no set date for a stateside release but im sure that wont be too far off.